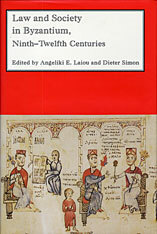 The essays in this volume investigate themes related to the place of law in Byzantine ideology and society. Although the Byzantines had a formal legal system, deriving from Justinian’s codification, this does not solve the problem but rather poses important questions. Was this a society which was meant to be governed by law? For answers, one must look at the intent of the legislators (to address specific problems, or to order society according to an ideal pattern? ); the attitudes toward the law; the relationship between law, religion, literature, and art. What were the spheres—political, economic, private—that the laws and the lawgivers sought to regulate? The concepts of law and justice are quite different from each other, and the relationship between them is investigated here. Of importance also, in this medieval society, are the connections between law and religion. There is the problem of the provenance of the law—whether the Emperor or God himself is the source of law—and the broad implications of the answer. At another level, ecclesiastical law was very important for everyday life, and the question arises of how much knowledge people had of it and how profound was their knowledge. Both people’s perceptions and their practices were shaped by their views of human justice and divine justice: whether these coincided, and whether they were administered through the same means, for the intervention of saints or icons might be seen as an alternative to human justice. As for human justice, there are questions that involve both society’s view of it and the education, knowledge, and interests of those who administered it. Such issues are present in all medieval societies; the case of Byzantium is of particular interest because of the interplay between formal law and the conceptualizations and practices—some quite divergent from the ostensible purpose of legislation—which affected the legislators, the practitioners, and all of society.